"In fact, they don't know what love is." One of the many truly cinematic presentations showing up at the Cannes Film Festival starting this week in France is the 6.5-hour feature from Portguese filmmaker Miguel Gomes. 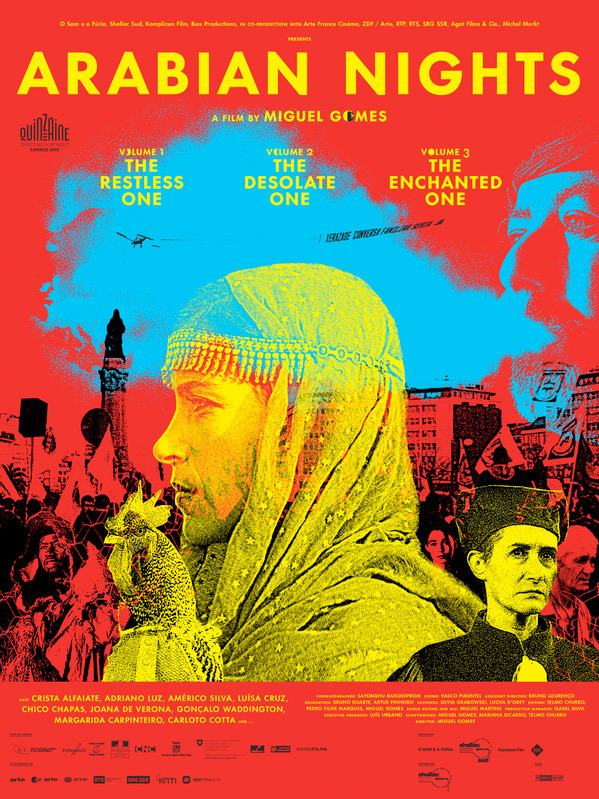 Titled As mil e uma noites, which they're translating to Arabian Nights in English, the film runs an exhaustive 381 minutes split across different parts, "The Restless One", "The Desolate One", and "The Enchanted One", connecting events in modern day Portugal with the ancient tales told by Arabic queen Scheherazade. I'm not really sure what to make of this, it kind of seems like it might be too crazy for anyone to sit through. Even this trailer is hard to sit through, and it's only 3 minutes! So have at it below if you dare. Miguel Gomes' new film As mil e uma noites, or Mille et une nuits, or Arabian Nights, will be presented in 3 parts: Volume 1, The Restless One, Volume 2, The Desolate One, Volume 3, The Enchanted One. It's best to just feature this biography from the Quinzaine Realisateurs: Born in 1972 in Lisbon, Portugal, Migue Gomes studied Cinema at Escola Superior de Teatro e Cinema (ESTC). He worked as a film critic in the Portuguese press and published several articles related to the theory of Cinema. Miguel Gomes presented his film Our Beloved Month of August in 2008 at the Directors' Fortnight. He returns in 2015 with Arabian Nights, a triptych inspired by the tales told by "Scheherazade" and the events that occured in Portugal in 2013 and 2014. If you're interested, keep an eye out for eventual release details or more festival appearances. Anyone? I think I'll check it out. Don't count on it being in one sitting, though. WOWZER! Six and a half hours of film! Intermissions, please. These damn trailers - I feel like I've seen the whole movie! LOL. Man, this looks fantastic! Too bad there weren't English subtitles, but the cinematography is superb. If The Hobbit is allowed to be 7.9 hours for barely 300 pages of material, then the adaptation of this old influential tome of 1000+ pages is more than fair, actually. I'm glad they split it into three parts, so if I get the chance I'll definitely give the first part a go and will watch the other two if I like the first one. "connecting events in modern day Portugal with the ancient tales told by Arabic queen Scheherazade"......... so that her own husband won't have her raped and executed, of course............. "Gotta' love the Middle East, man!"